It is the early 20th Century, and the great museums of Europe and America compete for artifacts from around the world in order to fill their museums with the most prestigious exhibitions. 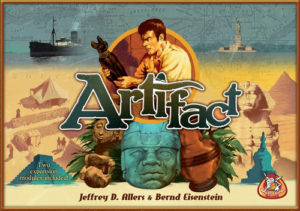 In Artifact, players are archaeologists researching sites around the globe to search for artifacts, which are then shipped back to the museums in order to produce exhibitions that increase funding for future digs and earn prestige to win the game. Actions and funds are limited, however, and competition is fierce. Sometimes it is even necessary to deal on the black market in order to generate extra income or to acquire the one artifact that will complete a valuable exhibition. The player who earns the most prestige points through producing exhibitions and managing his budget best wins the game. Artifact is a rich gaming experience that provides players with many options to think about. In order to make it easier to learn the game, the rules have been separated into the Base Game, followed by rules for the two expansions that, when added, make up the Complete Game. The game can be played and enjoyed as the base game or by including any one of the expansions, but the complete game is highly recommended for experienced players. » German rules (1,6 MB). » English rules (1,6 MB). » French rules (1,6 MB). » Dutch rules (1,6 MB). » Italian rules (3,0 MB).